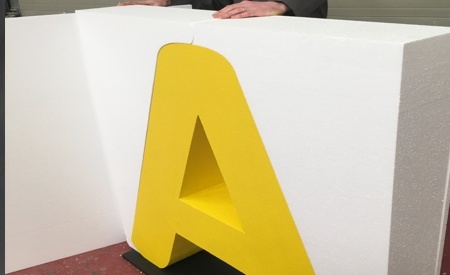 Polystyrene Letters uk, packing and delivery. -Lettres en polystyrène, mousse / mousse de polystyrène lettres. Lettrage géant, logos et signes de polystyrène. The packing and delivery method will vary depending on the size and style of the letters. In most cases the letters will be packed in the sheet that they are cut from. This keeps them very secure in transit. 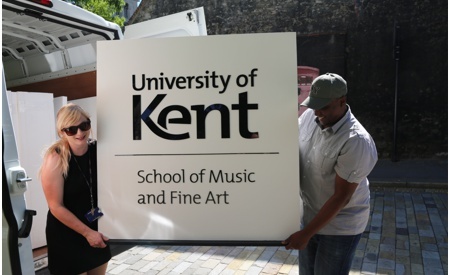 For some very large letters we may need to use a combination of polystyrene packing sheets, bubble wrap and cardboard. Being economic with materials is always on our mind, and we don’t want you to have too much packing material to dispose of. If there is not enough packing on the product, there is the risk of it being damaged in product, which of course is something we do not want to happen! We will always ensure to provide the best packaging solution for your order. If you need your order in a hurry, we can help! We work closely with local and national couriers who can deliver your items the very same day if needed. Our standard delivery options are usually a next working day delivery ( after production ), though if you would have more specific requirements, then please let us know. No matter the size of your order, we will always suggest the best mode of transport. In most cases we like to have your order delivered well ahead of time, however there are occasions, photo shoots for example, where the studio is booked for a specific time, and you need delivery on the day. Our drivers will often travel overnight, and can be on location very first thing - or at any time you need them. If you need your order delivered outside of the UK, then this is also something we can arrange for you.